Q: Does RoboMail has built-in SMTP server? A: Yes. RoboMail has a built-in SMTP server. By default, it will use built-in SMTP server to send emails out. Q: I want to use my own SMTP server. How can I do that? A: You can specify the SMTP server settings in "Settings - Sending Settings" under "File" menu. Q: Can I adjust the speed in sending emails? A: You can specify the sending speed in "Messages sent per minute" in "Settings" under "File" menu. The fastest you can set is 60 messages send in one minute. Q: How do I know whether the emails are sent out successfully? A: You can highlight the email template and click the "View Log" button to view the sending log. It will lists out the email address and whether email can send out or not. Q: I don't want to send the same email twice to the same person. Is it possible to remove the duplicate entry? A: You can uncheck the "Allow Duplicate Emails" box in email template. RoboMail will skips all the duplicate emails address automatically. No recipients will receive the same email twice. Q: I want to create a feature-rich email, is RoboMail support HTML emails? A: Yes. RoboMail support HTML email. Q: Is it possible to make attachments? A: RoboMail allows unlimited number of email attachments. You can make attachment in email template by clicking the first icon. Q: Can Robomail handle un-subcribe requests? A: Yes. RoboMail process un-subscribe requests via POP3 email accounts. You can specify the email address and email title to handle un-subscribe. Un-subscriber send the request to this email address with specified title. 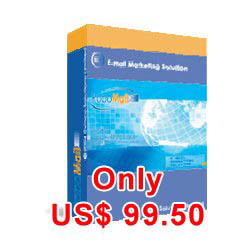 RoboMail will then retrieve all the emails with this specified title to process the request. You can send those email address and title in "Settings - Unsubscribe Settings" under "File" menu. Q: How can I make a batch import the address book? A: You can import the address book by using a excel file. In the address book, highlighted the group and click "Import" button. Please ensure the upload excel file follows the sample import file format. You can then import the customer details into the RoboMail. Q: How to make the email not marked as SPAM/JUNK? A: The marking is made by the recipient's mail server. You cannot override it but you can reduce the chance the email is marked as SPAM. You should make email personalize and avoid those "spam symptoms". Q: Why all the emails send out are FAIL? A: You may check the SMTP settings via menu "File > Settings > Sending". Verify the settings in RoboMail exactly match what your ISP provides: no typos (e.g., smtp not smpt), extra spaces, punctuation mistakes or capitalization errors. If you using RoboMail built-in SMTP, you may check whether your ISP block port 25. In an effort to stop spam, many ISPs block all traffic to port 25 on anything except their own SMTP servers. In this case, you cannot use RoboMail built-in SMTP server. You need to use ISP's SMTP server. Q: RoboMail says the emails are sent out SUCCESS, but I receive nothing? A: If the email is marked as SUCCESS in RoboMail, it means the email is already sent out and leave the RoboMail software. There are many reasons why the email is not delivered. Some antivirus software (e.g. Norton) will scan the outgoing email. If the email is sent from a non-default email client. The antivirus software will block it. You may configure your antivirus software to allows the outgoing email. This is similar to the case of antivirus software. You may consult your system administrator to config the firewall to allow email sent out. When email server suddenly receives a large amount of same email in short period, it may marked those email as SPAM/JUNK. The email will be drop into SPAM folder. You may check the JUNK folder to see if the mail is drop there or not. Q: Why RoboMail start to FAIL after about 100 emails? It works again on the other day. A: Some ISPs may apply limitation on number of emails sent out per hour (like 50, 100 or 200). They may block further email sent out if the sending limit is reached. You may consult your ISP on this matter.